iRealHousewives | The 411 On American + International Real Housewives: Dorit Kemsley Dishes On Her Birthday Dinner Party And Explains Why She Decided To Open Up To Teddi Mellencamp Arroyave About Her Past Issues With Lisa Rinna! Dorit Kemsley is taking to her Bravo Blog to dish on this week's episode of The Real Housewives of Beverly Hills. 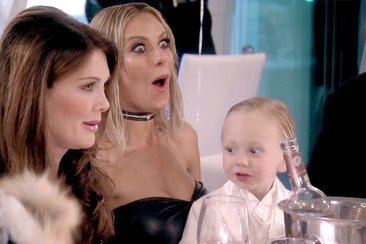 Dorit Kemsley dishes about her favorite birthday gift and that dinner with Teddi and Edwin. "This week’s episode brought back so many lovely memories from my birthday! It’s mind-boggling to think that last year I was butting heads with Lisa R and Erika, and this year PK invited them to my birthday dinner at Lisa V’s restaurant Villa Blanca. You know I love a good Birkin, but no birthday present could outshine the moment when my sweet Jagger surprised me in his white tuxedo. Jagger calling Erika and Lisa V “bad guys” was nothing short of an innocent 3-year-old expressing himself through his imagination, as he was in a phase where he loved superheroes and bad guys. On another note, can we talk about Lisa R standing up and giving a speech at my birthday party? For a second, I felt like I was in the Twilight Zone, but after all I’m grateful that we’re in a more peaceful place now. In case you didn’t know, I love to cook! I grew up watching my mom express her love through food, and I followed in her footsteps. I’m very particular about my table settings, and I believe no dinner party is complete without a divine dinnerware set, like the one I splurged on! I wanted to have a one-on-one dinner with Teddi and Edwin because I’m excited for PK and I to get to know them better. From what I’ve heard Teddi say about her childhood, she’s very humble and down to earth, and those are rare qualities to come by in this town. Over dinner, I felt comfortable opening up to Teddi about my tribulations with Lisa R. Teddi was clueless as to what transpired between us, and I was merely explaining why I feel I should be cautious as Lisa R and I enter this new phase of our relationship. Still, I’m going into it with an open mind and an optimistic outlook."